No doubt about it, Devolver Digital have an eye for quality, last year bringing us the likes of Minit, Swords of Ditto, and Crossing Souls. Their track record speaks for itself, and the charming Pikuniku from Sectordub is yet another jewel in their ever-gleaming crown. It’s a busy month, filled with some massive games, but this little diamond for PC and Switch absolutely needs to be on your radar. Pikuniku feels like the reincarnation of Dizzy the Egg – with an added splash of Loco Roco – the world has been waiting for. Or maybe just me. Probably just me. But seriously, Codemasters, stop what you’re doing, play this through to the end, then get hard-boiling some ideas with the Oliver Twins. You won’t be sorry. Pikuniku is a puzzle game where you roll down slopes, hop around, and solve stuff. But instead of bopping up and down with a pair of boxing gloves, our red circular, flower-like friend has a pair of oversized legs which he can use to kick things. Boulders, people, birds, pieces of toast. You name it, you have a license to punt it. It all kicks off a bit weirdly, though. You start the game with an in-your-face advertisement from a group called Sunshine Inc, who try to encourage you to swap your scrap metal for free gold. Sounds like a wonderful initiative, right? Very generous. An oversized robot hovers overhead, picks up your old junk and then deposits lots of money from the skies. Perfect. What could be better. I’ve got a flat full of it. I. Am. In. Except their logo is a top hat, and they start calling me perfect and overemphasise the free money part and their tag line says ‘A Better World Awaits’. And now I’m feeling a tad suspicious, thinking about those emails I get filtered as spam, telling me I can get free money and all I have to do is give them my bank details for a quick transfer. Something doesn’t smell right. I’m not sure I can trust these guys and now I can see where the ‘revolution’ part of the games’ tagline might come in. But before it delves any deeper, the transmission gives out and I find myself asleep in some old cave with a ghost hovering over me, urging me to wake up and find a way out. Cool, cool, standard fare, seems innocent enough. After a bit of kicking, swimming, and jumping, my red-leggy buddy tumbles outside, breaks a bridge, and is suddenly accused of being ‘The Beast’ by a group palette of Mr Blobbys’ with whiskers. It’s fair to say, in this case, I’m probably more terrified of them than they are of me. And that’s where you come in. It’s up to you to restore the villagers’ faith and prove you’re not a beast – or are you? – by fixing their bridge and helping them with their daily chores. Which is where the game makes it first major swerve and introduces a ‘hat mechanic’. Some puzzles actually require you to wear a hat. In one instance, you’ll need a ‘Pencil Hat’ in order to draw the face of a scarecrow and make it extraordinarily terrifying. The neat thing about this? You can design whatever you like in confines of the game, really drawing – see what I did there? – on your Mario Paint skills from nineteen years ago! Speaking of Mario Paint, there’s actually a secret back room where you can jump up and down on a piano. With it, you can make basic melodies by playing chords and ringing bells dangling over your head for no reason other than self-gratification. 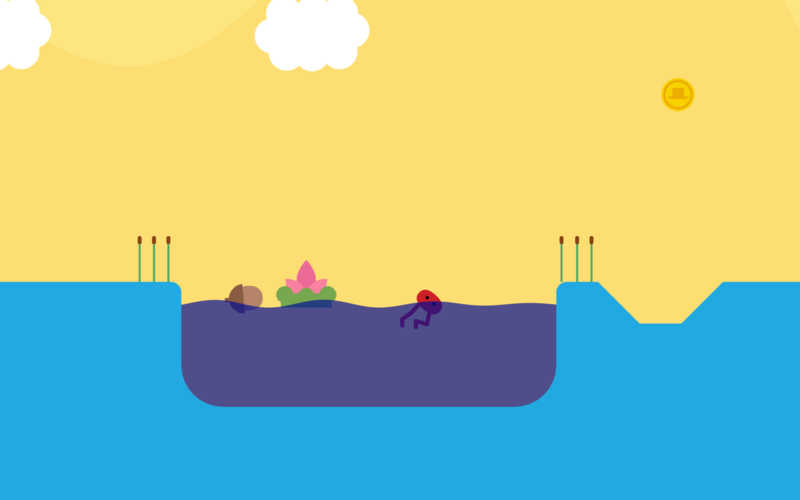 Pikuniku is full of cute little easter eggs like this, but also fun mini-games for you to discover on your own. And the magic in them is that they serve no progressive purpose other than offering you something to do as you move from screen to screen. Bounce between branches to climb up the clouds in the sky, watch insects do breakdancing, and even dunk yourself as a basketball. Just because. Speaking of that, there’s a fantastic mini-game in here that is a proper throwback to Rayman Legend’s Kung Foot! You go head to head with one of the blobby whisker people and have to kick a watermelon into a basket, which inevitably results in you kicking each other. There’s nothing in the rules to say you can’t, so that’s probably all you will do. Until you remember the purpose of it all again and try to win. And that’s where Pikuniku shines brightest, it’s absolutely hilarious. There were a few times I had to stop playing through laughter because a joke completely tickled me. Underneath its charming exterior it has a clear message it wants to convey to the player, but it does so in a way that never takes itself too seriously. Give it a chance and you’ll soon find yourself swept up in its highly energetic absurdity. Best of all, the game has co-op levels for you to play with a friend, seperate from the long-form narrative. 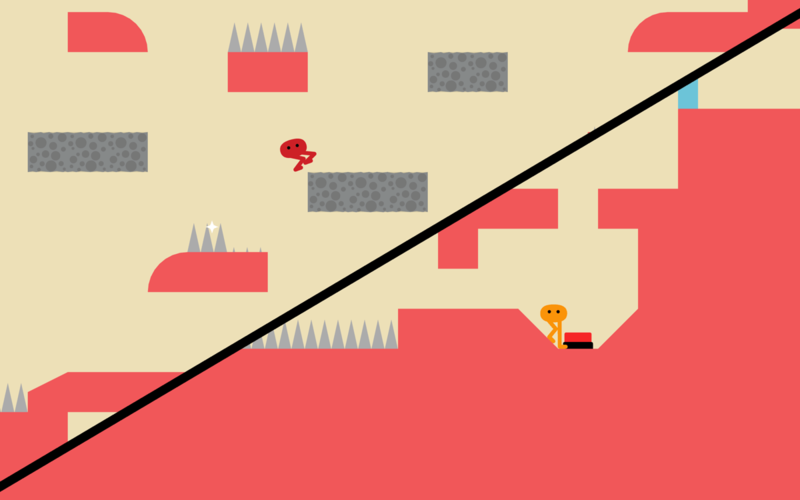 In this series of levels you’re both split apart and have to work together to reach the exit. One of you may have to stand on a switch while the other walks through a door beneath. You might also have to use your buddy as a footstool so you can get extra height. And with true split screen ala LEGO games, both of you have clear view of where you’re going and what you have to do. Some lag spikes and slowdown aside, Pikuniku is an absolute treasure, whether you play on Switch or PC. Sectordub have smashed it with the fabulous soundtrack, the way it looks, plays, feels, and everything else in-between. Pikuniku has me completely wrapped around its’ overly long legs. For real, Codemasters, get this team working on a Dizzy reboot! Review code kindly provided by the publisher. Played on PC.